Disclaimer: For each sale that is made through the purchase links in this post I get a small commission (that does not affect your final purchase price!). Of course, I'd love if you bought any app through these links, but I have tried my best to make my review faithful. I don't want anyone to come later at me and say they were tricked into buying any app and the review was unfaithful to the application. Anyway, I won't get rich quickly (probably not even slowly) by these sales, but they will work the normal upkeep of this blog. I draft a lot of my posts in my iPod Touch. Writing long posts in an iPod Touch (or iPhone for that matter) may seem tough, but it is not. Once you get used to it, you can write pretty fast on its virtual keyboard using only your thumbs. But using which app? 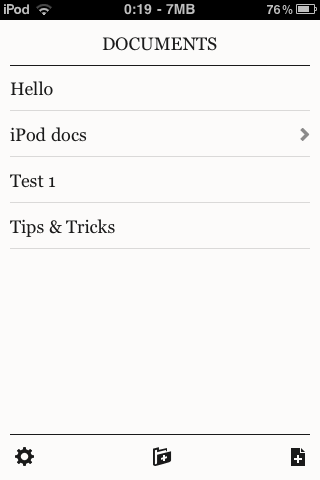 I used to do this blog writing using BlogPressLite (I even wrote a review of BlogPressLite), and then switched to just the iOS plain Notes application. But Apple got in the way, and added what at first looks like a good feature: mail syncing & backup. The catch? Its faulty, and you end losing half of what you wrote. I have lost big chunks of text (and even one full post while I was in Iceland) caused by sync problems. Needed to find a better solution. I stumbled on this post, reviewing different Dropbox based text writers (Writer, Elements and PlainText), and as PlainText was free, trying it was a no-brainer. 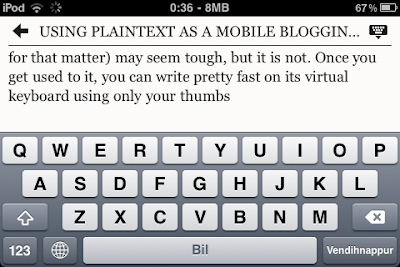 PlainText (from the creator of WriteRoom for iPhone) is a very neat and simple application. You can just write, in an almost empty user interface. The only killer feature (besides its charming minimalism) is two way sync with your Dropbox account. Yes, true. You can write in your iPhone, edit in your Mac, close up in your iPhone and draw the final lines in your Linux machine. And at what price? Free. Ad based in a future release (with in-app purchase to remove completely the ads), but the advertising will appear only when reading your text, not when writing. All in all it is almost a perfect solution. I have written this review using PlainText (see screenshot below) on the train back home from guitar class, and also made corrections to a draft of this guest post in Dragos Roua's blog. Free application+solves a real problem=epic win!